President Michael D Higgins has paid tribute to the victims of the 1974 bombings in Birmingham. 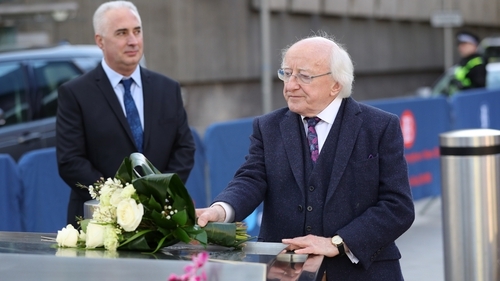 President Higgins and his wife Sabina, who are on a three-day visit to the UK, laid a wreath at a new memorial near the site of the bombings. President Higgins met relatives of the 21 victims at a memorial honouring all those who died. Three steel trees have been erected outside New Street Station in the city centre. The sculpture's leaves bear the names of each of the victims. The Birmingham Irish Association lobbied for a new memorial that symbolises peace and hope for the city. President Higgins acknowledged that the bombs had a very negative effect on the daily lives of Irish people living in Birmingham in the 1970s and 1980s. He also reassured Irish communities that after Brexit he would lead efforts to maintain a strong and lasting relationship between Ireland and the UK. President Higgins and his wife will now travel to Liverpool for two days of engagements. There, they will be greeted by the Prince of Wales and Camilla, Duchess of Cornwall.